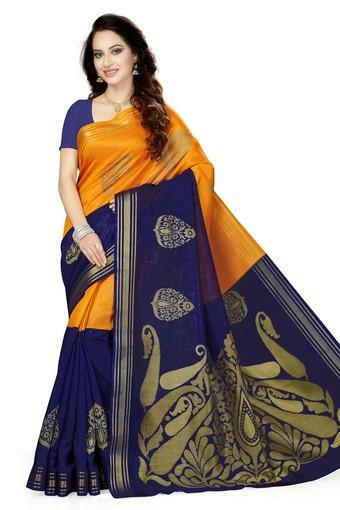 This bhagalpuri art silk orange & blue printed party wear wedding wear casual wear festive wear new collection latest design trendy womens saree will be a perfect addition to your ethnic collection. Ishins women clothing exclusive collection comprises of trendy and appealing georgette, chiffon, silk, cotton silk, bhagalpuri, handloom, mysore art silk sarees for women, sarees below 500, women sari with lace, ethnic wear for womens latest design will surely impress today's women. This light weight, trendy and eye catching sari is perfect for day wear & evening wear on any occasion. The length of the saree is 5.5 metres plus 0.8 metre blouse piece, width - 1.1 metres (approx).